Turkey is a great source of protein, which is important for muscle growth and strength. Try swapping in turkey mince in recipes for a lighter take on minced classics. 1. Place the turkey in a large shallow dish and add the buttermilk, garlic and thyme. Allow to marinate for at least 2 hours, or better still, overnight. 2. Combine all the ingredients for the celeriac remoulade in a large bowl and mix thoroughly, until the celeriac is fully coated in the dressing. Season to taste and set aside. 3. Heat a large griddle pan over a medium to high heat. Brush the sourdough on each side with the olive oil. Place two slices on the pan and cook for 2 to 3 minutes on each side, until nicely charred. Remove from the pan and set aside. Repeat with the remaining two slices. minutes on each side, until cooked through. 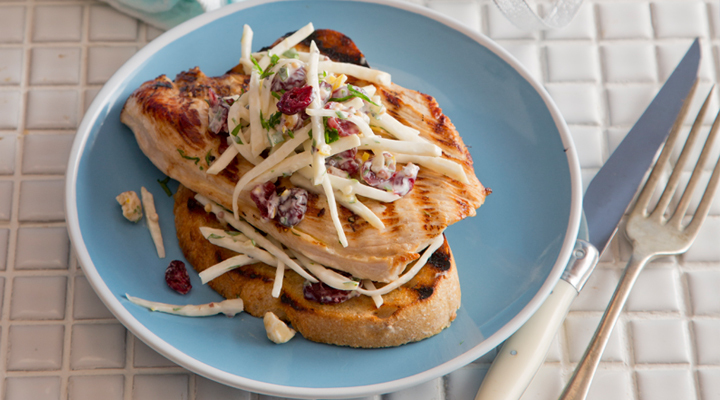 turkey steak, then spoon over some celeriac remoulade.